Carroll Partners is employed by our principal Buderim Ginger to supply their entire range comprising of over 80 different ginger products on their behalf. 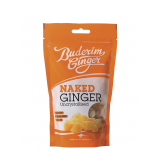 Buderim Ginger commercial products are in a format and a style to suit almost any use. Whether your ginger requirement is for Industrial & Ingredients, Retail Trade or Foodservice there is a Buderim Ginger product to suit. Sugar processed ginger dusted with a fine icing mixture. Select Dice - described by the number of pieces per 500 grams. These include 55/85, 70/100 & 100/140. Minicube - 10mm cubes dusted.